The good old checkered blazer revisited the market this fall. They are literally seen everywhere and every blogger out there is wearing them. I bought mine from Aland while I was in Seoul this summer. It was the perfect throw-on piece. And I mean throw-on by literally throwing it on last minute before heading out without thinking "oh does it go with my outfit". 98% of the time, it DOES. The other 2% you can overcome by picking the right shoes. Here I wore a pair of Lacoste white sneakers (similar here). There are soooo many different ways you can style this blazer and that's why the blog title says 1.0 because there will be 2.0, 3,0... My single favorite clothing piece this year has to be slip dress, the silky type. They immediately give you a classy and luxurious look. And by styling with a blazer you can prolong the days to wear them (I have yet to find a way to wear them in the winter). 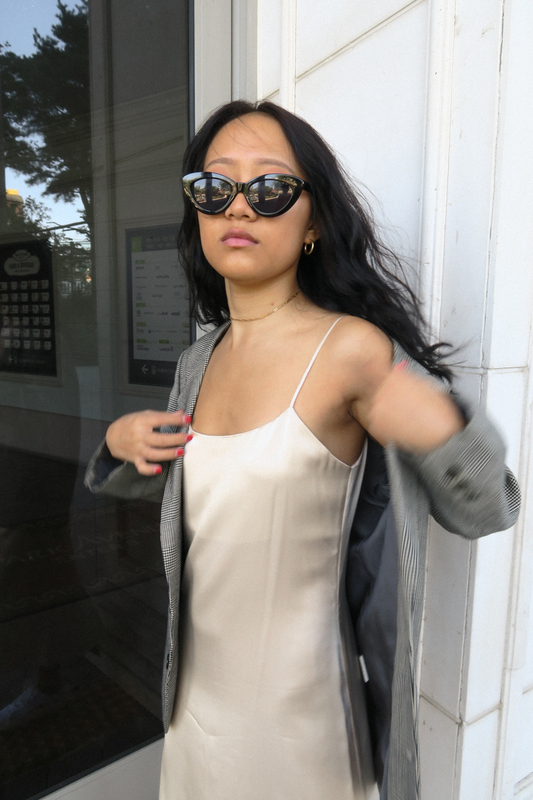 My slip dress is from Reformation and unfortunately it was their seasonal piece and I couldn't find them anymore on their site.